In the battle against ever-declining organic reach, Facebook Groups just might be your brand's secret weapon. If you feel ready to throw in the towel on organic Facebook strategy, we get it. Declining organic reach for Facebook Pages has been a much-discussed (and bemoaned) trend for several years, and it’s gotten even worse in 2017. Buzzsumo recently analyzed over 880 million Facebook posts by brands and publishers and found that from January to June of this year, the average number of engagements per post fell from 340 to 264. That’s a 20% decrease in just the past six months. Facebook addressed the decline in 2014, saying that it could be attributed to increased competition (read: increased content) and changes to their algorithm, which started to filter the content that appears in the newsfeed. The purpose of this filter is to create a better experience for the user, showing the posts that an individual is most likely to find interesting. From a brand perspective, it’s not purely an obstacle: the algorithm gives posts the chance to reach your audience that might have been missed with the purely chronological newsfeed of the past. A contributing cause, suggested by Buzzsumo and others, is likely the increased focus on paid promotion on Facebook, drowning out the space that would have gone to organic posts in the past. So what's a frazzled social media manager to do? There are several logical approaches to combat the problem. One theory holds that if there’s more competition for content, you need to make exceptional content that truly stands out from the pack. You need to deeply research and understand your audience to make sure the content you produce is something they won't be able to resist. But savvy marketers are already doing these things. Another solution is to treat Facebook as purely a paid platform, and to not invest any time in organic content. Paid content is certainly an important part of Facebook, and if you’re not doing it at all, you’re missing a huge opportunity. But ignoring organic opportunities on Facebook entirely isn’t realistic for a lot of brands. You could also try to "hack" the algorithm by giving it exactly what it wants and paying attention to its changing whims. Hubspot provides some suggestions for hacking the algorithm to your brand’s advantage in an excellent article here, but even these tips aren’t going to get your organic reach back up to what it was two years ago. Still others have suggested posting more video content to your Facebook page, since Facebook prioritizes video in the feed. Marketers have already started abusing this part of the algorithm, in some cases posting still images in video form. Plus, as of January 2017, videos are also ranked based on their length and rate of completion. Shorter videos and videos that people don't finish watching won't get as much of a boost. While video is an extremely important medium, creating a quality video clip of even 15 seconds takes a lot of time and resources, so this isn't a silver bullet solution for boosting engagement either. We’ve outlined the problem you're already painfully aware of, and gone through the various ways you can combat this using page posts and ads. What if we looked beyond those familiar tools? We propose removing the focus from your Facebook Page for a moment, and turning your attention to something that both Mark Zuckerberg and Sheryl Sandberg have been talking about a lot lately: Facebook Groups. In June of this year, Mark Zuckerberg announced that Facebook’s mission had changed to “give people the power to build community and bring the world closer together." As opposed to merely increasing the number of Facebook users when the missions statement was to "make the world more open and connected," the focus is now on the (perhaps more complex) goal of increasing the engagement and activity of Facebook users. Those who were last in a Facebook group circa 2009 might be scratching their heads at the seriousness with which Facebook is approaching Groups, remembering them more as jokes (see: “I Will Go Slightly Out of My Way To Step On a Leaf That Looks Particularly Crunchy”) than as forums for meaningful dialogues. There are still remnants of these kinds of groups, but many of them faded out when Facebook overhauled the format in 2011 and required admins to upgrade to the newer format. In recent years, as the Communities Summit demonstrates, there are many grassroots-style leaders who have successfully built meaningful communities using Facebook Groups. The private Facebook Group “Affected by Addiction Support Group,” a support group for people in active addiction and those in their lives, has over 50,000 members. “Tech Ladies,” a networking group for women who work in the tech industry, has over 18,000 as of this writing. There are hundreds of other private groups that nurture meaningful communities, as detailed in this July New York Times article. And just last week, Facebook announced new features for Groups to specifically aid in building communities, based on feedback from power admins. Among the new features are member profiles, which allow group members to click on another member’s name and see a profile that is specifically for that group, based on publicly available information. This is useful for Facebook users who may want to have a degree of interaction with fellow group members but not add them as friends with their main Facebook profile that they use to keep in touch with people they know in real life. A Facebook Group segments the audience into a self-selected contingent, which is extremely valuable for brands, especially larger ones. In much the way that targeted paid Facebook ads do, posts within a Facebook Group reach a specific, segmented audience. 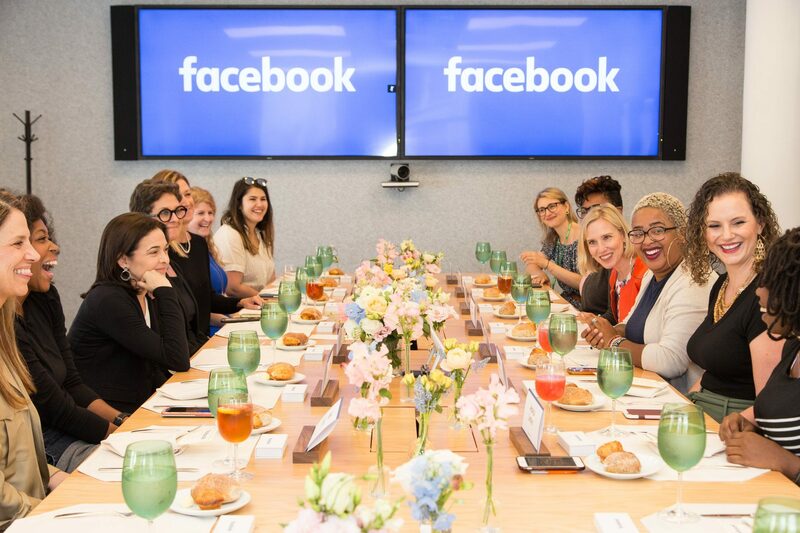 Allison Esposito, the founder of Tech Ladies, has seen firsthand how powerful a Facebook Group can be. Initially an informal coffee meet-up in New York City, Tech Ladies became a larger and larger side project until Allison decided to quit her job at Google to work on Tech Ladies full-time. The group has grown from a few dozen to 18,000 women and non-binary individuals in less than 2 years. Each member must apply and is individually screened beforehand, which ensures that every member is qualified to be in the group, and is an actual person (not a bot!). 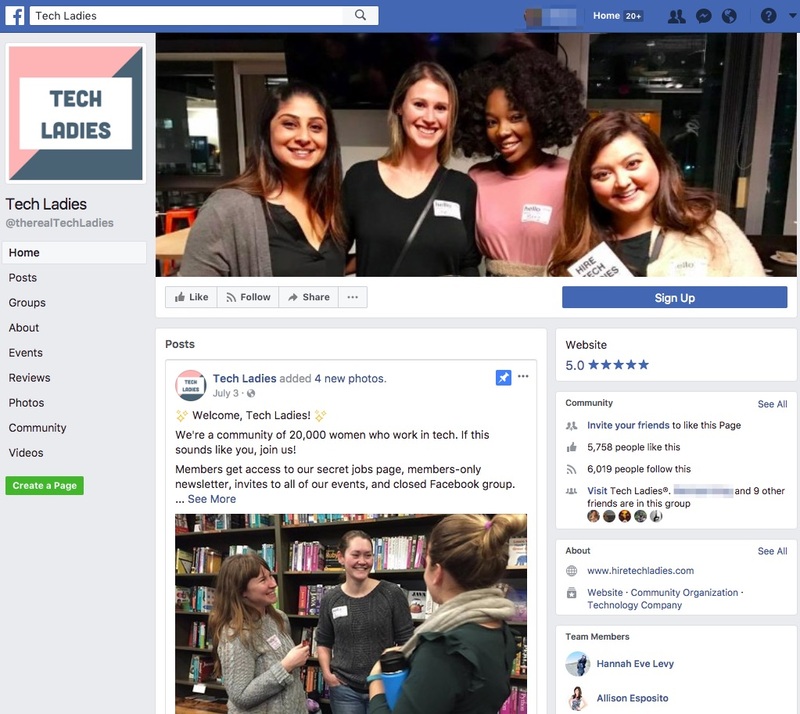 A screenshot of the Facebook Page for Tech Ladies, which started as just a Facebook Group that has since grown into a company with a website (hiretechladies.com) and brand partnerships. A Facebook Group can give you a real-time view of the conversations your audience is having. The information you can glean from an active Facebook group can even be more valuable than surveys and other traditional research methods. In fact, Buzzsumo pointed out in a recently published article that insights from your Facebook Group can be used to inform your overall content strategy. It’s like your persona research is already done for you. 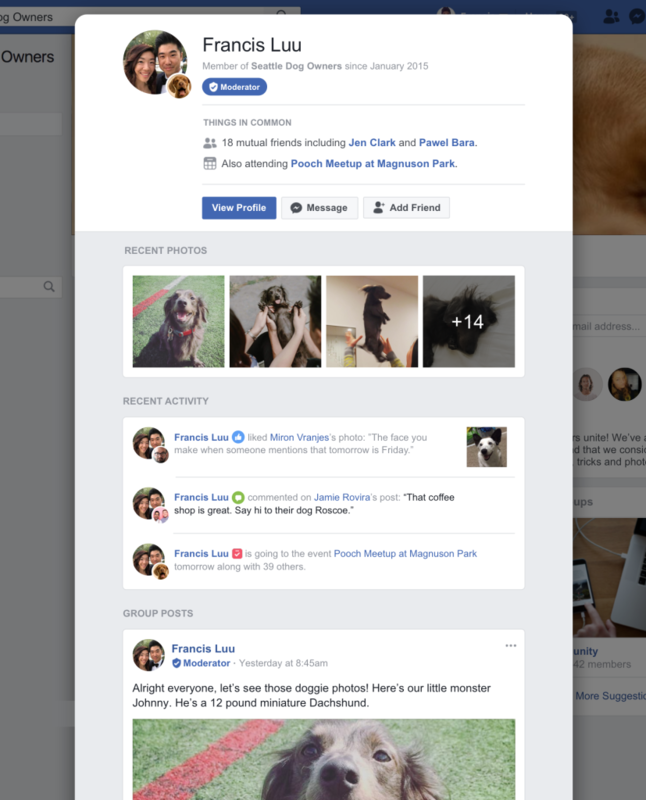 In July of this year, Facebook’s Chief Product Officer Chris Cox announced the launch of “Groups for Pages,” which allows “artists, businesses, brands, or newspapers” to “create fan clubs and groups centered around their superfans.” The announcement cited the success of the group “PostThis” by the Washington Post as one of the inspirations behind the launch. 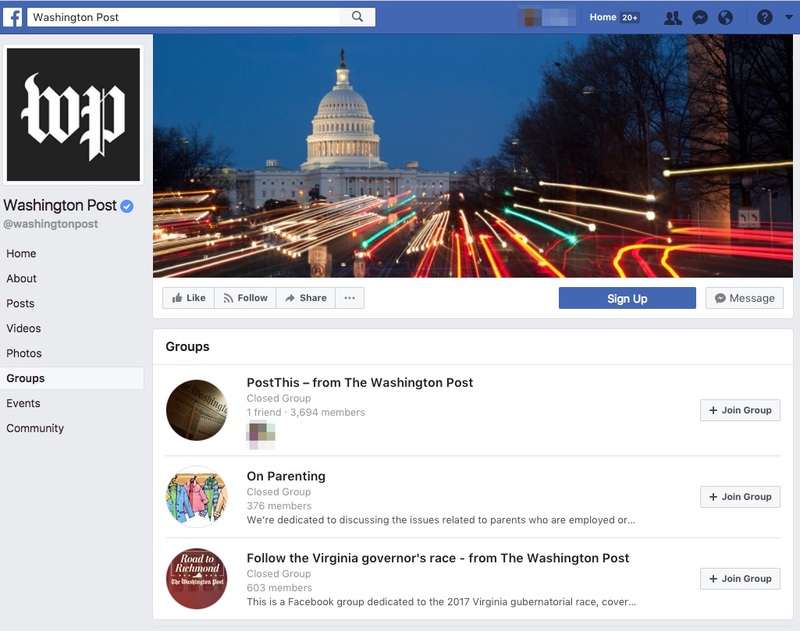 Cox described “PostThis” as a digital version of letters of the editor, where the publication’s most avid fans were able to have “ongoing, real-time discussions” with Post staff. Prior to this, a brand wasn’t able to link a Facebook Group to its Page. Having a formal connection and easy way to integrate a group with a brand page allows brands to tap into the audience they've already built with their page. Should Your Brand Launch a Facebook Group? While maintaining a successful Facebook Group for your brand won’t cost you dollars in ad spend, someone will need to create and post the content and serve as a moderator, so it’s not a completely cost-free venture. Still, it’s clear that Facebook Groups are a major priority for Facebook in 2017 and beyond, and for many brands it could be extremely valuable, assisting with growth by providing better audience insight, and even creating brand promoters. Industry. Communities build naturally around ideas, not products. Does your industry lend itself to discussing ideas? If the content posted in a group comes off as a hard-sell for your product, it’s probably not going to inspire a lot of genuine participation from your audience. Audience. Who is your audience? Are they already using Facebook a lot? Are they open to adopting new formats and places to connect with others online? Current engagement levels on social. Does it seem like there’s an opening for an additional channel in your current social media presence? High engagement on another platform like Twitter could indicate that there is potential for discussion among your audience in the format of a Facebook Group. Does your brand currently have a Facebook Group? Are you going to create one now? 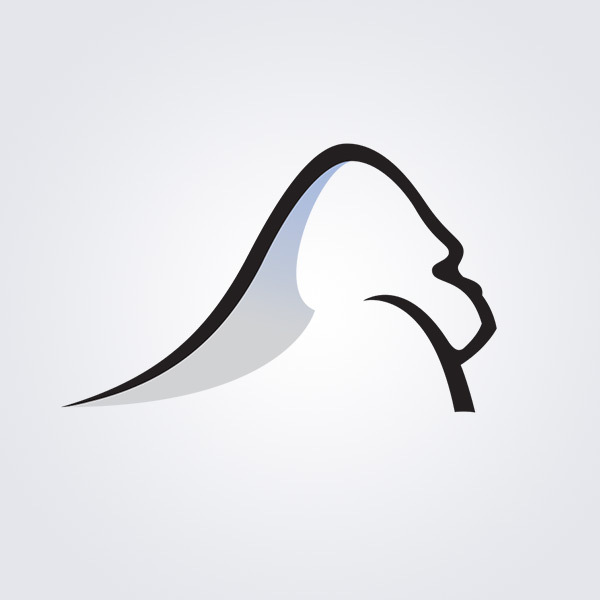 Let us know what successes or challenges you’ve had, or just what you think, by reaching out to us @silverbackstrat.